Election Day is almost upon us. I think the only thing that everyone can agree on is that it’s all been very interesting. I thought about voting early, but I must admit that I really love voting on Election Day. Whenever I enter the voting booth, I say a little prayer of thanks to the generations of women that made it possible for me to exercise that privilege. 1920 really wasn’t that long ago–when my grandmother was born, women were still 13 years away from gaining suffrage. And yet, people don’t seem to know much about suffragists, even though their work directly affects so many of us. I’m not sure how Bicycle Madness by Jane Kurtz ended up on my to-read list. But I moved it to the top when we started planning a bicycle event at the Village. And even though it didn’t affect plans at work, I’m so glad that I finally read it. All the pieces fit together for a practically perfect work of historical fiction. Lillie has just moved to a new house. She no longer lives next door to her best friend, but now she lives next door to Frances Willard. Frances Willard is one of those remarkable 19th century women that not a lot of people know about. Suffragist, teacher, temperance advocate, labor rights advocate, and more. Oh, and bicyclist. Bicycles gave women a measure of freedom that they hadn’t had before–they could get places more quickly without having to hitch a wagon. For three reasons. First, my love of adventure has been pushed underground too long and now it is bubbling up. Second, a bicycle is a powerful tool that will be under my foot. . . Last, but not least, I shall do it because a good many people think I cannot at my age. How can you not fall in love with Frances Willard? Gladys (the bicycle!) 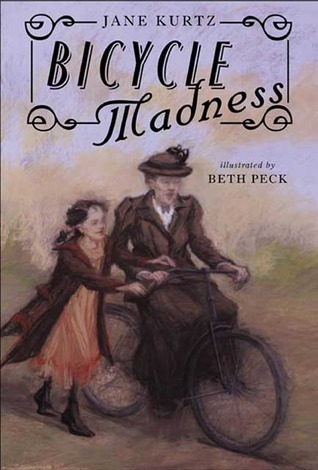 is quite the challenge, but as Frances learns about the bicycle, Lillie learns more about other points of view. Lillie is absolutely charming, and the story feels completely natural. So often when you throw in a real historical figure into fiction, it doesn’t work. This does. There are other deeper threads woven into the story too–suffrage, of course. But also labor rights. And how to move on after the death of a parent. It’s a beautiful, well-crafted story. One of my favorite parts of Kurtz’s writing is the way she uses late 19th century language and slang. Lillie’s voice feels historical, but not in a stuffy way. All the details feel natural–Kurtz’s priority seems to be a good story, though she’s certainly opening up lots of moments for teaching along the way. How much did I love this book? Enough that I downloaded the inspiration of this book, Frances Willard’s account of learning to ride a bike, A Wheel Within a Wheel: How I Learned to Ride the Bicycle. Haven’t read it yet, but I’ll get to it one of these days. So, as we deal with all this election madness, might I recommend taking a few moments to learn a bit more about one of the suffragists that made it possible for everyone to be able to vote? Might I suggest Frances Willard?